The U.S. 2016 presidential campaign moves from the convention floor to the next campaigning stage as both candidates update their strategies for how to increase economic growth. With U.S. GDP at 1.2% for Q2 2016 and the average quarterly U.S. GDP for this recovery the weakest since WWII (use insert from WSJ here), there is clearly a need for the candidates to find ways to increase economic growth. As a political economist, I believe there are five key policy areas politicians can use to stimulate growth via businesses. First, tax reform. The goal is to stimulate the economy via reduced tax burdens on businesses and thereby increase the return to capital. 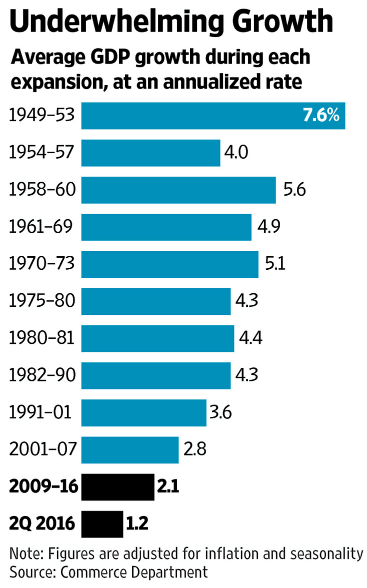 (WSJ) Second, free trade. Lowering barriers to enhance the free flow of goods and services increases trade and removes economic inefficiencies that slow growth. Third, regulatory relief. The New York Times reports, “The Obama administration in its first seven years finalized 560 major regulations — those classified by the Congressional Budget Office as having particularly significant economic or social impacts.” This was nearly double the previous administration’s number of issued regulations. While regulations can bring positive change, regulations impose costs on businesses and often slow growth. Fourth, infrastructure spending. This benefit comes in the form of increased transportation efficiency with little lasting impact for construction and engineering job creation. Fifth, energy production. While the price of oil has dropped significantly over the last two years, the U.S. economy needs reliable, consistent and inexpensive energy to fuel growth. With these five areas in mind, let’s take a look at what Republican candidate Donald Trump and Democrat candidate Hillary Clinton have recently proposed for policy in these areas. Remember, our candidates must persuade Congress in order to pass their respective agendas. On August 11th, Clinton gave a speech in Michigan where she outlined many of her key economic and tax proposals. For business tax reform, Clinton’s approach is to create “sticks” or disincentives for U.S. businesses engaging in unwanted behaviors. She proposes an “exit” tax on U.S. companies attempting to invert or redomicile to a foreign country with a lower tax rate. Another of her proposals limits the deductibility of interest on debt when it is used to reduce a company’s tax burden. She also wants to terminate carried interest for money managers. Clinton also has some carrots to encourage desired behaviors like hiring workers for apprenticeships or creating profit sharing programs for workers. Lastly, she stated she would simplify and cut taxes for small businesses, but doesn’t provide specifics. On regulatory relief, Clinton believes in the continuation and strengthening of the Obama administration’s policies on the Affordable Care Act, Dodd-Frank, Clean Power Rule, and the Paris Climate Accords. On infrastructure, Clinton has proposed a $275 billion infrastructure spending plan to create jobs and increase efficiency in the economy through better roads, bridges and tunnels. Additionally, her plans include a $25 billion infrastructure bank to support “critical infrastructure improvements” and reauthorize a Build America Bonds program to help finance projects. Finally on energy, she wants to install 500 million solar panels to generate enough renewable energy to power every home in America by 2020. She also wants to create a $60 billion clean energy challenge to partner with states, cities, and rural communities to cut carbon pollution and expand clean energy, including for low-income families. She wants to eliminate tax subsidies for oil and gas companies while seeking strict new regulations on fracking. On August 8th, Republican candidate Donald Trump outlined his economic and tax proposals in Detroit. For business tax reform, Trump’s plan is to cut the nominal corporate tax rate from 35% to 15%. For pass through entities like subchapter S corps or LLCs, he limits the tax rate to 15% from 39.6% (top tax rate). On international taxes and to eliminate incentives for inversions, he has a one-time 10 percent tax on all foreign profits currently held overseas, which are estimated to be over $2.3 trillion. Lastly, he wants to eliminate all other corporation tax expenditures or break. Trump also wants to eliminate the corporate Alternative Minimum Taxand wants to substantially reduce the deductibility of interest expenses from debt. On free trade, Trump has been very clear he is against free trade agreements like the proposed Trans Pacific Partnership and wants to renegotiate the current NAFTA agreement. On regulatory relief, Trump wants a broader moratorium on new U.S. government agency regulations. Also, he specifically proposed a temporary moratorium on new financial regulations until the economy shows significant growth. Trump has said in the past he would repeal and replace Dodd-Frank and the Affordable Care Act. On infrastructure; like Clinton, Trump wants to create a spending plan to rebuild roads, bridges and tunnels. He recently proposed a $500 billion spending plan to be funded by new borrowing. If we break down these two sets of plans for growth, the answer is not very satisfying or productive. When we review our top 5 areas for growth, neither candidate hit all 5 and both candidates fail on trade. 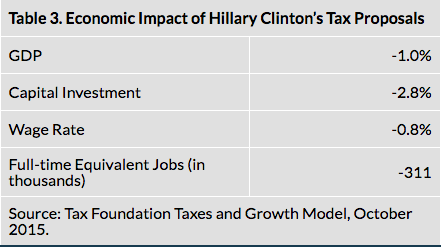 Following the Tax Foundation analysis, we see that Clinton’s plans probably won’t generate much economic growth; however, they probably won’t produce much of an increase in the deficit or debt either. 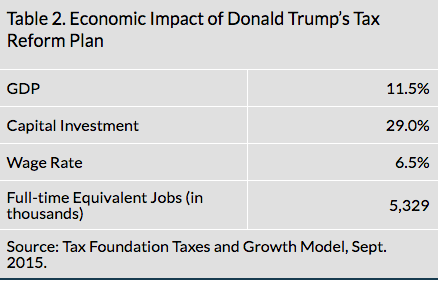 For Trump, the Tax Foundation analysis showed his plan would probably generate strong economic growth, but at a cost of a very large increase in the national debt. As the campaigns head into the fall, we can expect to hear passionate explanations for why each candidate’s policies create a better economic environment for the country. For now, the jury’s still out.